Our world has been dealing with becoming digital for almost 30 years, but the next frontier, digital transformation, is now upon us. 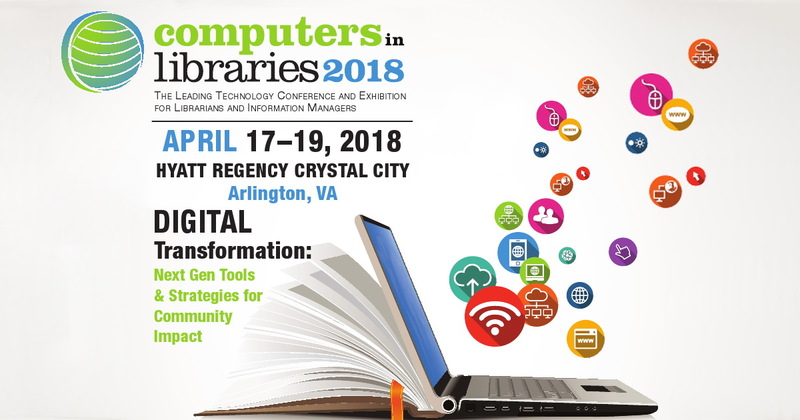 This year, Computers in Libraries will delve deeper into library models, strategies, transformational technologies, creative processes, and innovative programs while looking for new and exciting solutions to engage communities and have positive impacts on members. At Computers in Libraries, you'll hear from excellent and innovative libraries, network and learn from leaders in the field, and definitely be an active participant. Mark your calendar now to join your peers in Arlington, VA in 2018! Currently, arXiv hosts more than 1 million of what it calls "e-prints." It has divided the discipline of physics into 13 subdisciplines, including astrophysics and quantum physics. Over the years, it has also added mathematics, computer science, quantitative biology, and quantitative finance. In September 2017, it added two new disciplines: economics and electrical engineering and systems science. Evidence in figshare's new "The State of Open Data 2017" report continues to suggest that academics are happy to get their credit wherever they can. For the second year running, more than 75% of researchers surveyed stated that they value a citation to their nontraditional research outputs (NTROs) as much as, if not more than, to a traditional output. This is consistent with indications that outputs other than publications and their impact will be rewarded at an equal level in funding decisions. Pew Research Center's Internet & Tech division published "The Future of Truth and Misinformation Online," which reports, "Experts are evenly split on whether the coming decade will see a reduction in false and misleading narratives online." Gerald Leitner, secretary general of the International Federation of Library Associations and Institutions (IFLA), released a statement thanking voters for contributing to the IFLA Global Vision discussion initiative. The Library of Congress started its Congressional Data Challenge, a competition for anyone looking "to leverage legislative data sets on congress.gov and other platforms to develop digital projects that analyze, interpret or share congressional data in user-friendly ways." Accessible Archives, Inc. will complete its digitization of page images for all books in its American County Histories collection by the end of 2017. So far, 34 states' documents have been completed. EBSCO Information Services is now accepting submissions for its second annual SEE-IT (Stories Engagingly Expressed-Illustratively Told) Award. Given in partnership with the Graphic Novel Committee of the Children's Book Council (CBC), this award honors "the outstanding achievements of authors and illustrators in youth graphic novels." NewsBreaks often covers the latest surveys and reports from Pew Research Center, "a nonpartisan fact tank that informs the public about the issues, attitudes and trends shaping America and the world." Its website has eight topic sections, each of which showcases the latest research, which is collected in reports, fact sheets, or other formats that extrapolate respondents' answers to cover the entire U.S. population. ... Here's a roundup of the latest news from each section.